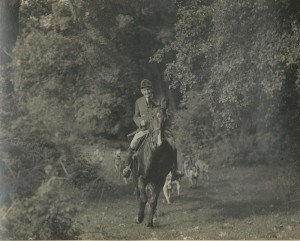 Hunting the Puckeridge Hounds as a young man. The father of all four younger Barclays, Charles Geoffrey Edward, was born at Brent Pelham in the heart of the Puckeridge Country on August 13th 1919. Known fondly by his many friends as Charlie and of later years as the Captain, his childhood was spent with his younger brother Billy and sister Pamela hunting with the Puckeridge where his father and grandfather had been Joint Masters for some considerable time. His education took him to Eton, where he whipped into Ronnie Wallace, before going on to study agriculture at Cambridge where he took on the Mastership of the Trinity Foot Beagles. Ronnie then progressed to Oxford where he became Master of the Christchurch College Beagles.